I found a patch mega this afternoon - red-breasted flycatcher. I found it late afternoon in the plantation, a first year bird by the look of it, no orange on the throat, just a buffy wash on the throat, upper-breast and flanks. When I fist got onto it, it was flitting around in the pines, perching occasionally, flicking its wings, often obscured. When it did perch out, my crap ability with my camera let me down again as I couldn't get the auto-focus to find it amongst the background pine twigs. For a flycatcher, it was very illusive, disappearing at times completely, relocated by its rattling call. I had originally intended to put a high-tide seawatch in this afternoon, until texts from my friend Steely on the Farne Islands with tales of migrants arriving convinced me the bushes were a better option. We were ringing this morning. It was quite quiet in the bushes, with a lot of birds seemingly moved out overnight. 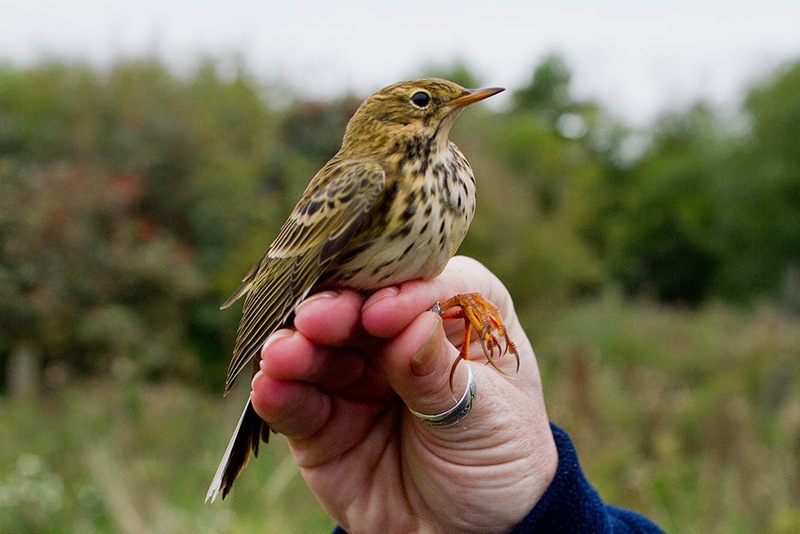 The highlight was catching some meadow pipits, nine in all, in one of our more open nets. We caught our first song thrush on the autumn but only one warbler, a chiffchaff.